They call it Big Tree Country on account of the giant redwoods and Douglas firs pointing arrow-like towards the sky. It could be America’s wooded west coast, but this is north Perthshire, home to trees as wide as a terraced house and claiming to be the tallest in Britain. It’s also known as Highland Perthshire, an area stretching from Glen Garry and Blair Atholl in the north to Loch Tay in the south with its mix of heather-clad hills and fertile farmland populated by red squirrels, deer, mountain hares and golden eagles. 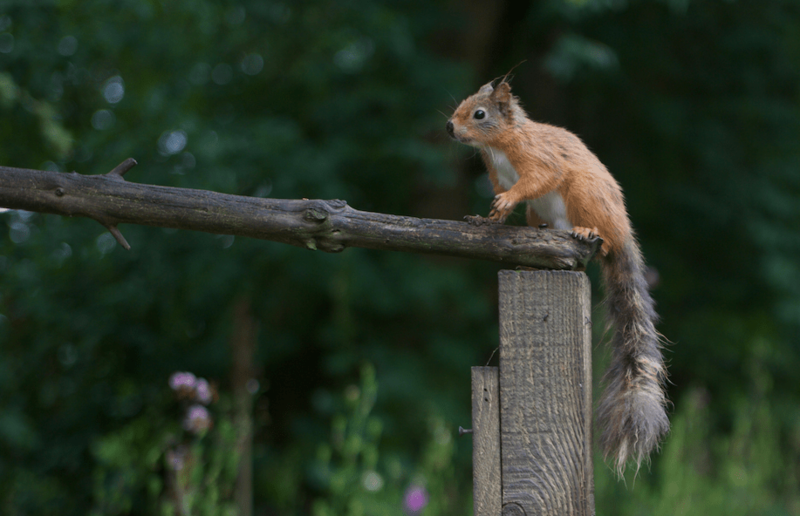 For those searching for tranquility and picturesque countryside, there is no better place to enjoy leisurely walks while seeking out Scotland’s rich fauna and wildlife. A private lodge, managed by Hilton Grand Vacations on the Dunkeld House Hotel Estate, provided a base for a few days and was a restful bolt-hole on the edge of the town. The hotel, which was acquired in 2016, has a beautiful outlook on to the Tay, and while the lodges were not included in the change of ownership, lodge guests can make use of the facilities, including the indoor pool. The hotel has a delightful setting, nestled among surrounding hills, and there is a nice walk along the river into the town past its part-derelict cathedral. 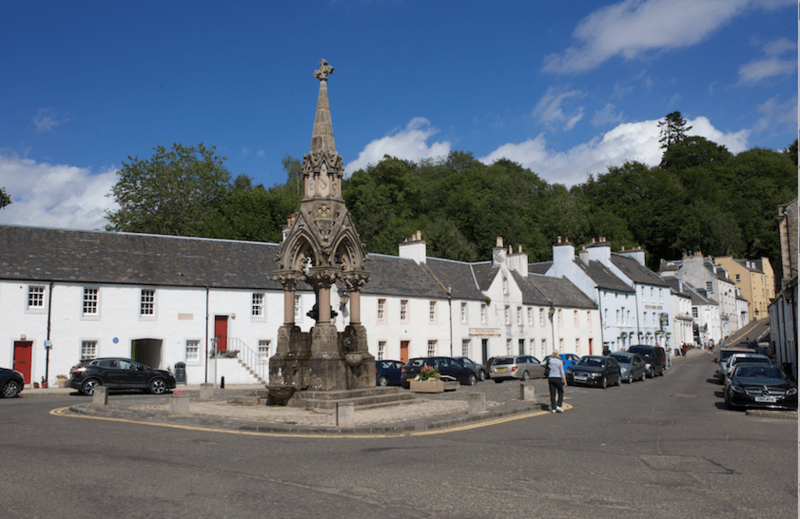 Dunkeld itself has a bustling main street with restaurants, cafes and delicatessens dotted among the historic inns and cottages. Just across the Tay is the famous Hermitage, a popular wooded destination for aristocrats and literary giants in the nineteenth century, now owned by the National Trust and featuring cascading waterfalls and winding footpaths. Alas, the tallest tree in Britain, which guarded the river for more than 260 years, was a victim of high winds in January 2017. Arguably the most celebrated tree is the oak in nearby Birnam, reputedly the last survivor of woods made famous by Shakespeare in his Scottish play, Macbeth. Reaching the tree means passing two other ageing giants and the keeper of these woodland treasures has added a nice touch, by planting two signs making it clear that visitors have not yet reached the old oak. Dunkeld and Birnam were also put on the map by the children’s author, illustrator and botanist Beatrix Potter who was a regular visitor. One of the homes where she stayed is still resplendent on the riverside, and there is an exhibition in the village devoted to her connections. Exploring further north, the A9 allows for short trips to Pitlochry, Blair Atholl and Aberfeldy. 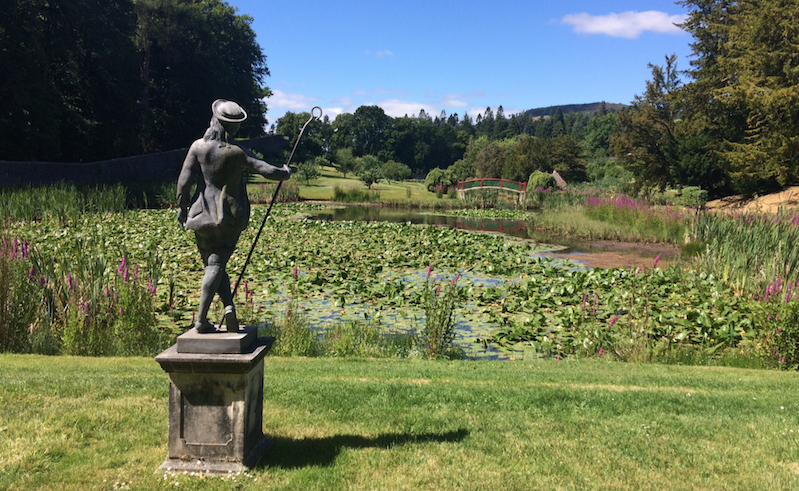 Having last visited Blair Atholl some 20 years earlier, it was a delight to see the restored and aptly-named Hercules Garden. Recreating this Georgian walled garden was clearly a Herculean effort, bringing an overgrown and derelict nine-acre plot back into public use. The castle itself, home to the Dukes of Atholl, offers 700 years of history in its 30 rooms and a stroll around the grounds is a treat. Beyond the main tourist destinations, there are some delightful and lesser known places that are worth seeking out. One such is Cluny House Gardens, north east of Aberfeldy, which is in the care of Wendy and John Mattingley. This a paradise for botanists and a wonderland for children with its wealth of plants skirting the narrow paths winding up and down the hillside. A huge hare bounded between the trees while a small clearance provided an ideal spot to await the arrival of the red squirrels and watch them run along the branches and collect food. In Aberfeldy the Watermill is a three-storey gallery, cafe and bookshop which is well worth a visit. It’s hard enough to find any bookshops these days and therefore refreshing to discover that this one is not only the largest in the rural highlands but was voted the best independent in the UK. The business also includes Homer, a home furnishings showroom which has a branch in Edinburgh’s new town. Dunkeld is just over an hour’s drive from Edinburgh and Glasgow. Blair Atholl Castle and Gardens: adult £12, child £10.30, family £35. Reduced prices for visits to the gardens only.